If you like the previous two books and the way J.D. 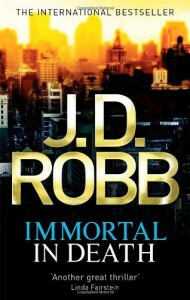 Robb/Nora Roberts writes, you’ll like this one and the rest of the In Death series too, I’m assuming. The main focus of this installment is on characterization, building up and fleshing out secondary characters, and of course Eve Dallas’ dark past, which resurfaces throughout the book. The revelations of it are very dark, which surprised me because I didn’t think Roberts would take it that far. Eve Dallas is an interesting solid main character with a violent past that she can’t shake and, worse, can’t recall clearly. She’s strong enough to carry this series. Eve’s love interest and her friends and acquaintances are also interesting in their own rights. They add interesting contrasts to her characterization and the murder mysteries. For most of the book, the writing is fine. A bit blunt at times and somewhat confusing due to shifting POVs, sometimes within the same paragraph, while two or more characters are discussing evidence and possible suspects. But the overall story is fine, sort of repetitive though since it’s similar in tone to the previous two books. The thing that keeps me from liking this series is Nora Roberts’ distinctive writing style. She leans too much on the love lives of both main and secondary characters, which is expected since Roberts comes from a romance writing background. What’s not expected is how she seems to go out of her way to make the murder mysteries, Eve’s past, and the general world of In Death as violent and as gruesome as she can. It’s almost as if she’s over compromising with the violence because of her romance writing background…? Personally speaking, I think the focus on the romance angles is at odds with the dark nature of the murder mysteries. I find the contrast between them awkward and sometimes unsettling. After finishing this book, I remembered why I don’t usually read serial mysteries or, when/if I do, I don’t follow a series any further than the third or fourth book because every book after this point is predictable. More often than not, the series locks itself into a pattern that puts it at a risk of becoming dull and/or formulaic if there aren’t any strong characters to carry the story. This happens to be the case for In Death. I think it has found its stride and is settling into a formulaic pattern. Which is unfortunate for me since I was sort of looking forward to this series improving with every book, but now I don’t know if I should read any further.